The Glasshouse Mountains, named by Captain James Cook in 1770, are a series of 13 breath taking volcanic peaks which jut out from the Sunshine Coast Hinterland, providing a spectacular backdrop to the Sunshine Coast. It is believed that the cause of these peaks was from the melting of crust above a 'hot spot' in the mantle below. Seven of these volcanic mountains are situated within the Glasshouse Mountains National Park, and home to many protected wildlife and plants species. When staying at our Holiday Village you get to experience living amongst these mountains with some magnificent views. If you're ready for a climbing adventure, you can enjoy the mountains close up, but be sure to check out the literature on each mountain first and choose one to suit your own fitness level. 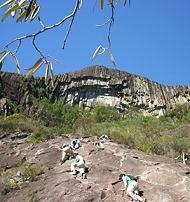 We can also book you on an organised rock climbing and abseiling adventure. 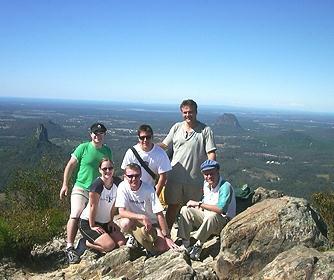 There are also many picturesque lookouts for great photographs, situated not far from us, along the Glasshouse Mountains scenic drive. The Sunshine Coast averages 7 hours of sunshine a day so don't forget to "Slip, Slop, Slap" along the way. "Slip on a shirt, Slop on the sunscreen and Slap on a hat"